Winter has come, Calgary! And Honda West has just the thing to fight it with! The 2019 Honda CR-V is the sales leader in compact SUVs, a point made obvious by its many capabilities and features. From a winter driving and safety perspective, the CR-V offers increased ground clearance, which allows you to better maneuver over snow and ice packs. All AWD trims include standard features such as the most advanced driver assistance technology available, Honda Sensing. Which includes popular safety features like Adaptive Cruise Control, Lane Departure Warning, Road Departure Mitigation, Lane Keeping Assist and more! In fact, the Insurance Institute for Highway Safety has again awarded the 2019 CR-V as a top safety pick. The interior is no less accommodating to the needs and tastes of the savvy driver. The CR-V has class-leading cargo space, with 1110L of volume available with the seats up, and a whopping 2146L when the seats are flat. There are seemingly endless smaller storage options in the interior, which, combined with greater leg and head room in the rear means you can fit everything and everyone into your CR-V! Standard features on every CR-V are Alloy wheels, backup camera, 6 airbags, automatic climate control, push button start with remote start, heated seats, and an electronic parking brake with automatic brake hold. The EX trim and above adds additional USB outlets for the rear passengers, 12-way power driver seat, sunroof, fog lights and the Lane Watch Blind Spot Display camera. Last, but definitely not least, every CR-V includes Apple Carplay and Android Auto, so you and your family are always connected with your media and contacts at your fingertips. 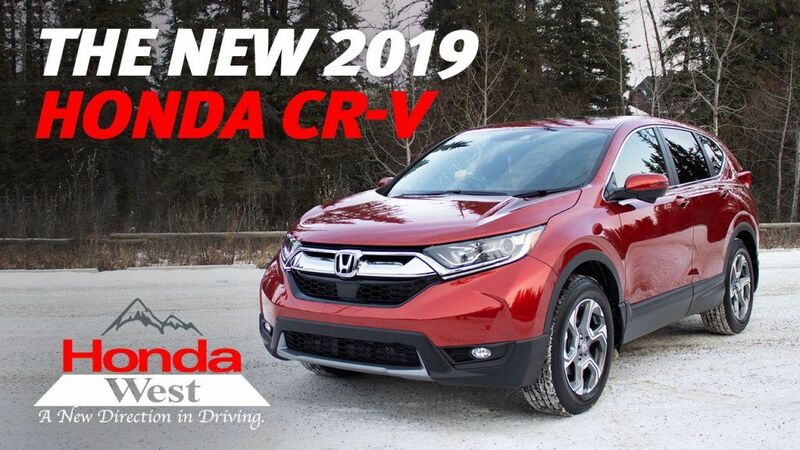 The 2019 Honda CR-V, there is no better choice for Calgary families!